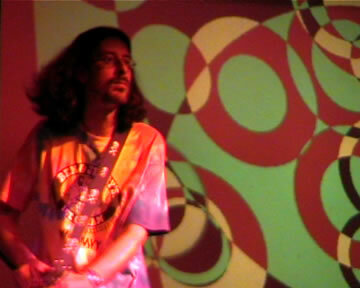 Welcome to issue 2 of liveartwork DVD. The second issue features seven diverse artists, ranging from Boris Nieslony, who for over 20 years has been a key figure in European performance art, to These Horses, an emerging performance theatre group working in London and Berlin. The DVD's total running time is about 90 minutes. NEW - All issues of liveartwork DVD are now available in both PAL and NTSC format. To get a copy of liveartwork DVD issue 2 click on the 'order' link above. Alexei Shulgin is a Moscow based artist, musician, curator, activist and professor. In his work he explores the boundaries between art, culture and technology and their relation to 'real life' effects. His favourite methods are mixing together different contexts and questioning the existing states of things. Shulgin has participated in numerous exhibitions and symposiums on photography, contemporary art and new media. 386 DX is the world's first cyberpunk rock band. It questions the ability of computers to replace humans - and the answer is always positive. The long awaited competition between live forms and robots has started. 386 DX realizes it on the most basic level - the level of a street musician. 386 DX consists of one computer. All the sounds of both musical instruments and vocals are synthesized in real time using text-to-speech and midi software. "Learn to leave your CV as empty as possible. Learn to breath, learn to roll, learn to stay, learn to live, learn to have no questions.. And so on." These Horses is an emergent performance company based in London and Berlin. We make work for a variety of sites and contexts. The live encounter with an audience is at the heart of our work, and our methodology aims to question and situate this encounter within wider social, experiential and subjective landscapes. The Beast Dwells / Yes, we will dance is concerned with performative practices of marking and honouring, and their relationships with place, lived experience and the coming together of people. Themes we return to are home and safety, the relationship of coastlines/borderlands to national identity, journeying and the idea of the foreign and the darkness and fear associated with what might be beyond our own comfortable horizons (both geographical and psychical). We are concerned with dancing as a wild, messy and often dangerous act; exploring popular dance forms, improvisation and task-based action, mythologies of 'liveness' and pure unmediated experience, dynamics of display and personal negotiations of media images. Joshua Sofaer is a London based artist and writer who is currently a Research Fellow at ResCen, Centre for Research into Creation in the Performing Arts, an artist-driven research centre based at Middlesex University in London. Interested in the boundaries between academic and professional practice, Joshua makes work in traditional art spaces and alternative galleries, both nationally and internationally. On Saturday 9th July 2005, twenty-three teams raced across London as part of Tate Scavengers. Their aim was to win £1000 cash and have their work exhibited at Tate Modern. Tate Scavengers was devised to engage audiences in the production of an artwork, using participatory performance to reflect on the ways contemporary art is produced. A wry comment on the operation of capital in the art market and the relationship between visual and performing arts, Tate Scavengers questions what it is that constitutes art. Tate Scavengers was devised and created by Joshua Sofaer, assisted by Stacy Makishi and produced for Tate Modern by Sophie Howarth, assisted by Caroline Brimmer and Melanie Lenz. Tate Scavengers was made possible with financial assistance from Tate Modern, Awards For All, Better Bankside and Outsmart. Originally from New Zealand, Kate McIntosh lives and works in Brussels. She performed as a dancer in several companies before shifting her own work towards theatre, performance and making video. 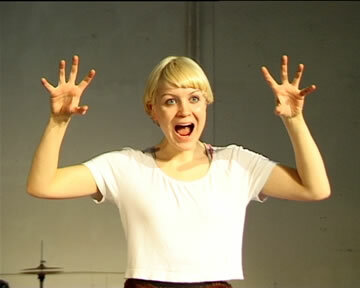 She initiates her own work but also collaborates on many projects, including the music and performance collective Poni. In the past she has worked with people such as Random Scream, Wendy Houston, and Meryl Tankard Australian Dance Theatre. All Natural happens on a theatre stage - one performer alone with the audience. The performance falls somewhere between a stand-up comedy and a Vegas dance routine. 'Characters' are built and collapsed as the showgirl explores, with increasing difficulty, various ways to co-exist with the audience. As each attempt crumbles, a discomfort and an unmet expectation become clear. All Natural began with research into the myth of 'naturalness' - and the craving for it in everything from food to personality. All Natural finishes in some doubt about the authenticity of the stage and social contact in general. "I have an instinct for failure, I can smell it coming. It's a natural thing. Yeah I can smell it now..."
Performance by Kate McIntosh with texts from Jo Randerson. Sound design by Charo Calvo. With help from Diederik Peeters. Co-Producers: Plateaux (Künstlerhaus Mousonturm - Frankfurt) Productiehuis Rotterdam (Rotterdamse Schouwburg) nadine (Brussels). With help from Margarita Productions, and Kaaitheatre (Brussels). Surman's practice follows a delicate but systematic exploration of how one might live, think, see and act, through an attempt to understand presence in the live theatrical event. At it's core is an insistence on "live" process: refusing to consider material which is brought into the process through a desire to realise a precluded event or image. Since 1994, Surman has shown nationally and internationally, solo and collaborative work in performance, installation and video. Past work has been commissioned by and seen at British Dance Edition 06, National Review of Live Art (Glasgow) Chisenhale Dance, ICA, CCA, OMSK, EXPO (Nottingham), Yorkshire Dance Centre and the Root Festival at Hull Time based Arts. Based in Glasgow for the past five years, she teaches performance on the Contemporary Theatre Practice programme at the Royal Scottish Academy of Music and Drama and has been the Associate Curator for Performance at the Centre for Contemporary Arts. This year Scottish Arts and Tramway have funded the development of a new work - titled Slow Thinking the new work can be seen as a complimentary and companion piece to .White. In .White, Surman examines the role of assistant to an absent magician and has to conjure moments of transformation and everyday enlightenment from the materials surrounding her. Working from a physical and choreographic core, she is interested in how we experience the world through constraints and conditions around us - be it work, gender or age. The drive of the work is to explore and excavate these conditions, drawing on theatrical devices, processed-based performance actions, feminist theories and contemporary culture. The film is made with a desire to capture a sense of the live work, but working with the frame it has to be seen in when documented - on screen, for camera. The creative collective Valie Export Society was founded by Kadi Estland, Killu Sukmit and Mari Laanemets in 1999. 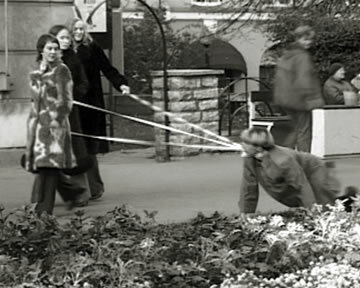 The format Valie Export Society uses is that of public actions/performances taking place in streets and other public spaces. The spectators of an action are not invited for a particular event but are casually confronted with the action in the context of their everyday life. Valie Export Society is based on principles close to those of social work - the work is dependent on its surrounding and the people who inhabit it. Touch Cinema takes place in front of the Sõprus cinema in central Tallinn. Three women wear boxes over their naked breasts as portable cinemas. Pedestrians are asked to check it out. This remake action is based on Valie Export's 1968 action Tapp und Tastkino. Homometer II - On a Saturday morning at Tallinn's main train station, three women tie homemade bread loafs to their bodies with ropes and invite passers-by to take a slice with a sharp knife. The remake is based on Valie Export's 1976 street action of the same title. From the Portfolio of Doggedness - Three women lead a man moving as a dog on all fours through central Tallinn during the rush hour. This remake action is based on the Valie Export's 1968 action Aus der Mappe der Hundigkeit.